The Ionic Gladiators have a rubber step pad the runs the length of the running board. These are perfect for children too since they don't always approach with caution. The Gladiators are made of a double wall aircraft grade aluminum for great strength. These boards will easily hold 300 lbs. The brackets are strategically selected and placed on your vehicle for the maximum strength. The Ionic Gladiator runs the length of the cab of your vehicle and makes sure there is a place to step at every door. Ships with different brackets depending on what you drive. Each bracket is designed to get the maximum strength while also having an easy, drill free installation on most vehicles. The black end caps feature a satin finish that look great with other black accessories. It won't corrode or rust since it's made of high impact ABS. Chrome end caps provide a mirror finish for extra shine and style. The construction also provides a corrosion resistant surface for a lasting finish. 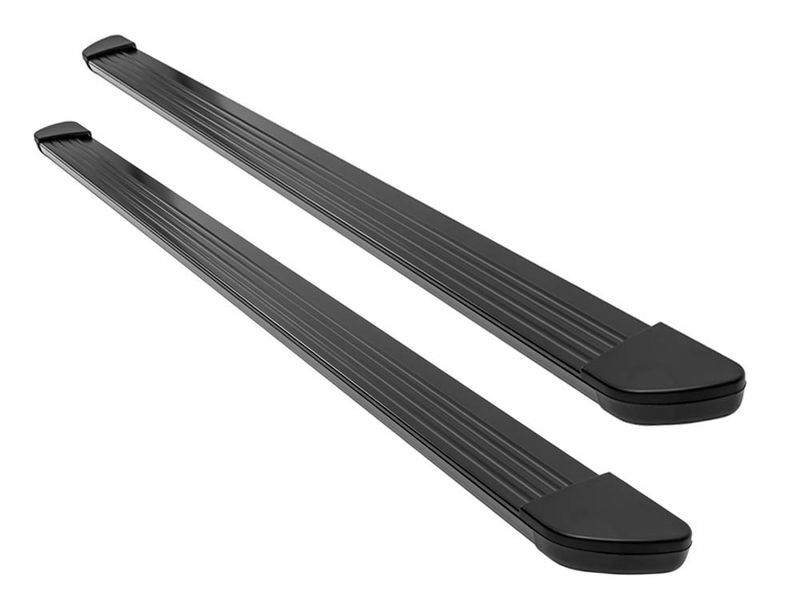 Show off your inner champion with the Ionic Gladiator running boards. You see a vehicle driving down the street and you want your truck or SUV to stand out. Let the Gladiator boards make your friends drool with their endless style and functionality. Each board features a 5" wide non-slip step pad and is coated in a durable black powder-coat. Constructed from double wall aircraft grade aluminum, you get unlimited stability while stepping up into your vehicle. Gladiator step boards are truly built to last! With no drilling required on most models and a limited lifetime warranty, you need a set of Ionic Gladiator running boards for your ride. Be the talk of the town, order your set today!